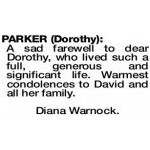 It is with great sadness that the family of Dorothy Parker (née Berghiner) announce that she died on April 9th 2019, at the age of 90 years. Her three children David, Anthea and Janet, her grandchildren Kate and Madeleine, and her great grandchildren Jude and William survive her. With Kim, Pierre, Sam and Dave they express their profound love for her. 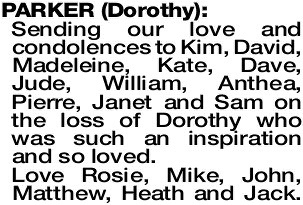 Dorothy's beloved husband Charles Alexander (Lex) Parker died in 2001. She was the only child of the late Itzec and Paulina Berghiner (née Rosenzweig). Dorothy has donated her body to science so there will be no immediate funeral. The details of a commemoration service of her life and work to be held at the University of Western Australia grounds will be announced in May. 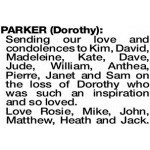 Sending our love and condolences to Kim, David, Madeleine, Kate, Dave, Jude, William, Anthea, Pierre, Janet and Sam on the loss of Dorothy who was such an inspiration and so loved. Love Rosie, Mike, John, Matthew, Heath and Jack. 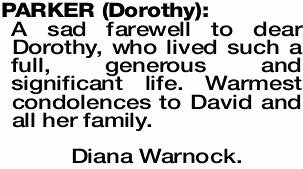 A sad farewell to dear Dorothy, who lived such a full, generous and significant life. Warmest condolences to David and all her family. PARKER DOROTHY Fond memories of a life long friendship with Dorothy. Our Italian coffee mornings gone but never forgotten.